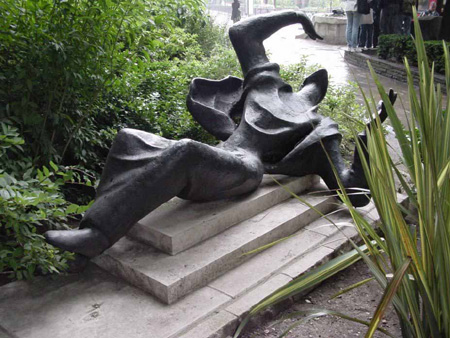 Made from fibreglass resin with bronze powders (‘resin bronze’), this sculpture suffered vandal damage in 2001. 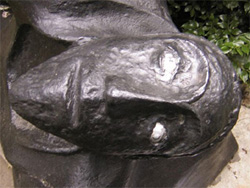 Although it was originally thought that the vandal had painted the eyes with silver paint, on closer inspection it was clear that someone had picked away the top layer of resin in the eye area, revealing a silver-coloured, secondary layer beneath. New material was carefully built up in the damaged areas, to restore the eyes to their original form, using reference photographs which we hold on file from previous inspections. The statue was later moved to the south-east corner of St Paul's Churchyard and is one of the numerous public sculptures which we maintain annually for the City of London. Edward Bainbridge Copnall was born in Cape Town but lived and worked in Horsham, Kent. Copnall originally conceived a statue of Becket to coincide with the 800th anniversary of his murder and a festival that was planned to mark this occasion, in and around Canterbury Cathedral, in 1970. The standing figure that Copnall first proposed was not commissioned, but he went on to produce the existing sculpture at least a year after the festival. 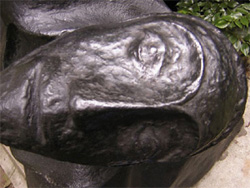 It is thought that the pose is based closely on a photograph of an actor performing the role of Becket in a production of ‘Murder in the Cathedral’ that was staged as part of the Canterbury festival. In 1970. 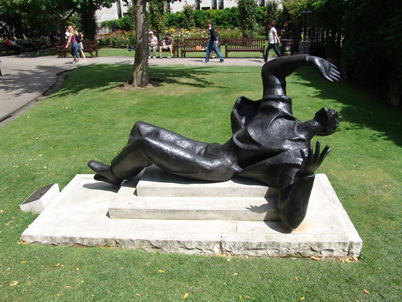 The City of London also commemorated the anniversary of Becket’s death with various events but did not purchase this statue until 1973 (the year in which Copnall died), at which time it was installed in the garden of St Paul’s Churchyard. Its acquisition and installation was recorded in The Times, The Guardian and the Daily Telegraph on 31st March 1973, and in the City Press on 5th April 1973. The original plinth stood a metre high, however the existing one is much closer to the artist’s original intention as it more closely replicates the Cathedral steps upon which Becket was felled. Copnall pioneered the use of fibreglass, and made the first fibreglass public sculpture in this country. He developed his own techniques by experimenting and frequently changed his methods and materials as he went along. The pioneering use of material is therefore a significant aspect of this sculpture. The issues of lifespan and long-term preservation of this material were not fully understood at the time of its making, which presents some maintenance challenges when the sculpture is sited outdoors. Several of Copnall’s projects are described in some technical detail in his book ‘A Sculptor’s Manual’, published in 1971, but there is no specific mention of ‘Becket’.